On our Tridion 2013 SP1 environment we get the following error message regularly. What can be the issue here? It occurs when browsing through the CMS. The issue dissappears when clearing cookies. I don't think there is something wrong with Tridion itself. Those cookies are set on another website with the same domain. Tridion is on a subdomain of that website. When those two cookies are set, all requests in Tridion gresult in a 400 or a 500 error. When I remove OR empty the cookie values, the issue is fixed. So it looks like Tridion can't handle cookies with comma's and braces. Is there a fix for? Finally we found the rootcause. The Web Application Proxy (WAP) is very strict in which kind of requests it accepts. According to the standards, a comma value is not allowed, see: https://curl.haxx.se/rfc/cookie_spec.html and https://stackoverflow.com/questions/25387340/is-comma-a-valid-character-in-cookie-value. 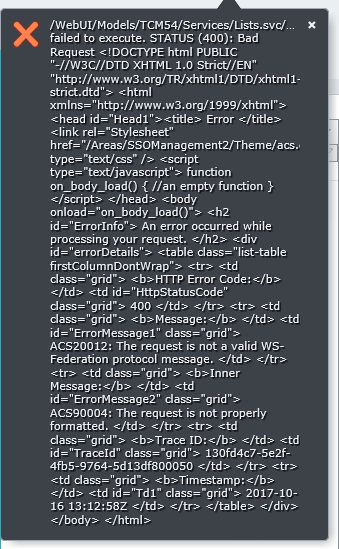 So the WAP is blocking all requests after a cookie with an not valid value is set. So the issue has not to do with Tridion but with the WAP, which is part of our infrastructure. The WAP is not the rootcause, but a script which sets cookies which are not following the standard. Not the answer you're looking for? Browse other questions tagged 2013-sp1 cme or ask your own question.